Need some advice on your reel and resume? 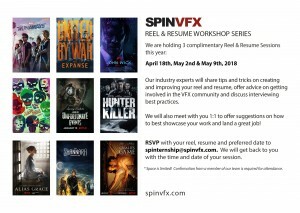 SPINVFX is holding three complimentary Reel & Resume Workshops in 2018: April 18th, May 2nd and May 9th, 2018. Our industry experts are here to offer advice on getting involved in the VFX community, as well as sharing best practices for interviews and resumes.